Black, White Hand Painted Chiffon Silk Scarf NIGHT WAVES. Size 8x54. Silk Scarves Colorado. Birthday Gift. Silk Art. 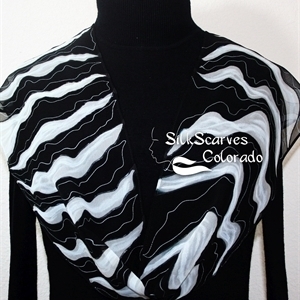 This is a 100% Chiffon silk scarf featuring zebra-like pattern in black and white; decorated with thin accents in silver. SIZE: This is a very elegant and chic scarf, perfect for adding a touch of color and style to any outfit - size 8" x 54" (20 cm x 137 cm). This is original size - slight shrinkage occurs due to the steam-setting process. Hand Painted Silk Scarf. Green, Turquoise Handmade Silk Scarf GREEN PEACOCK. Silk Scarves Colorado. Extra-Large Square 35x35. Wedding Gift. This is a 100% smooth China silk scarf in bright green, blue and gold, featuring a stylized peacock, and decorated with peacock feathers all over. It is a square silk scarf - very chic, sleek and elegant. SIZE: This is an EXTRA LARGE size square scarf 35" x 35" square (89 cm x 89 cm). Slight shrinkage occurs due to the steam-setting process.